Massachusetts native Thomas Hudner, of Fall River, was a war hero who was awarded the medal of honor in the Korean War now has a U.S. Naval ship named after him. 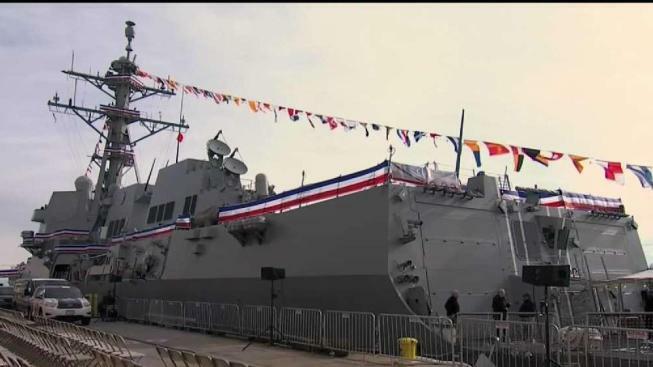 The newest warship in the U.S. Navy has docked in Boston. It was built not just to launch missiles and rockets, but also to pay tribute to a military and civil rights hero from Massachusetts. The USS Thomas Hudner arrived at Boston’s Flynn Cruise Port Terminal earlier this week. On Thursday, NBC10 Boston got a tour on board to see the latest combat technology up close. It is equipped to carry out anti-submarine, anti-air and anti-surface warfare. The Maine-built ship is 510 feet long and home to 312 sailors. “Our capabilities are amazing when it comes to what we can bring to the fight for America,” U.S. Navy Commander Brett Litchfield said. The warship is not just state-of-the-art, but also features a work of art dedicated to its namesake. In the mess hall, there is a mural in honor of Captain Thomas Hudner. The Fall River native was awarded the medal of honor for his service in the Korean War. Hudner risked his life trying to help his wingman, Jesse Brown, who had crashed after being attacked behind enemy lines in 1950. Hudner crash landed his own plane in what was a heroic, but unsuccessful attempt to save him. The story of Hudner’s heroism is known by all who serve on the ship named after him. Hudner was alive when the ship was christened in 2017, but the Concord resident died a few months later at the age of 93. His family will be in South Boston to watch the ship get commissioned on Saturday. It is the final step before it’s officially in service and sails on, making sure the legacy of Thomas Hudner lives on too.